First published in Steven's Window column in The National newspaper. Friday 9th October 2009. I teamed up with the Media Council of Papua New Guinea, led by Mr. Nimo Kama, the Executive Director and two of his dedicated staff members: Mr. Anton Huafolo and Ms. Elizabeth Turagil. Leo Wafiwa, Head of the Journalism and Public Relations program at the University of Papua New Guinea and I provided the technical support to run its pilot media literacy workshop in PNG. Why was it important that the Media Council organize a workshop on media literacy in Papua New Guinea? Media literacy is a 21st century approach to education. It provides a framework to access, analyze, evaluate, and create messages in a variety of forms—from print to video to the internet. Media literacy builds an understanding of the role of media in society, as well as essential skills of inquiry and self-expression necessary for citizens of a democracy. Media is constructed by someone for a purpose. As receivers of any constructed information we as readers, viewers, and listeners must ask if it is meant for us. We must unravel the constructed messages in order to understand the embedded meanings. Accepting media influences without understanding its impact in our lives is like being told to swim up a flooded river without considering the tide that would force us down river to the open sea. The influence of media in our lives is like the flood forcing us into the ocean of modernity where we are forced to drown in confusion. Many of our folks live in a state of confusion from the onslaught of media overload or media manipulations. How do we get them out of this state into one that makes them become critical receivers of information? How do we get our folks to become active participants in the production and dissemination of information using media technologies? How do we get our people to be active participants in the development of their communities? Such challenges presented themselves to the Media Council of PNG. Under the Media Development Initiative (MDI) and the Developmental Communication Initiative (DCI) funded and supported through AUSAID, the Media Council of PNG conducted a pilot workshop on Media Literacy Training at the Summer Institute of Linguistics (SIL), Ukarumpa in Kainantu between September 10 and 12, 2009. The Media Council of PNG approached the workshop as an opportunity to learn from community representatives about their responses, expectations, and reactions to media in Papua New Guinea. The Media Council in its efforts to remain a governing body knows that it is important to develop greater awareness among PNG communities about the process of information construction and dissemination. The workshop allowed the Media Council to link its development initiatives with the wider PNG communities. 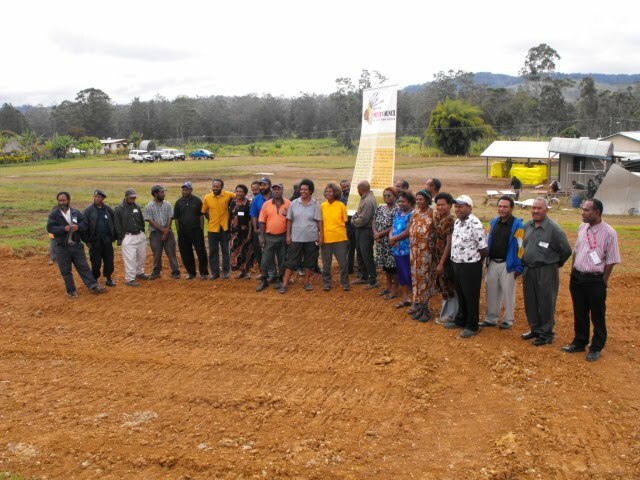 The workshop was also supported by SIL Ukarumpa as a partner in the development of PNG. The participants were drawn from the MOMASE and Highlands region. The participants were primarily from community based organizations, NGOs, women’s groups, church groups, community learning centres, literacy programs, the law and justice sector, and agricultural extension services. Most of the participants attended the workshop to learn what they can about media literacy tools to take back to their communities in the provinces. The workshop introduced them to world of media communications and some of the tools used in media to make a change in their own communities. Some of the media technologies have penetrated the diverse cultural and linguistic communities of Papua New Guinea. Media organizations continue the important role of information production, packaging, and dissemination. Other media vehicles such as theatre performances highlight HIV/AIDS, population growth and control, and law and order problems. In many cases media technologies are powerful tools of advertising products. To get Papua New Guineans to be literate in media’s role in their lives or to use media tools in their environment the Media Council of PNG began supporting various community initiatives around the country. The workshop format was derived from Five Key Questions That Can Change the World: Lesson Plans for Media Literacy, written by Jeff Share, Tessa Jolls and Elizabeth Thoman of the Centre for Media Literacy (CML) in Canada and Australia. The Five Key Questions are: Who created this message? What creative techniques are used to attract my attention? How might different people understand this message differently? What values, lifestyles and points of view are represented in, or omitted from, this message? Why is this message being sent? The five key concepts complementing these questions are: All messages are ‘constructed, media messages are constructed using a creative language with its own rules, different people experience the same media differently, media have embedded values and points of view and most media messages are organized to gain profit and/or power. The Five Key Questions and Five Core Concepts evolved from traditional categories of rhetorical and literary analysis. Over the years, media literacy practitioners around the world have adapted and applied this analytical construct to today’s mediated ‘texts’—from television and movies to billboards, magazines, even bumper stickers, and T-shirts. The effective use of media technologies has seen information transmitted across a broad spectrum of PNG society. Using these media technologies people have constructed information targeted especially for those receiving the messages. Some of these messages are useful and others are not, but one thing is clear. There is a need for media literacy in Papua New Guinea. The vision of the Media Council of Papua New Guinea is for a free, pluralistic and vibrant media that profits from promoting democratic governance and human development in Papua New Guinea by 2020. The media literacy training workshop in Kainantu is an eye opener. The Media Council of PNG affirmed its critical role in the relationship between the media and Papua New Guinean communities. I salute the Media Council of PNG for taking this bold approach in making our people literate in the kinds of media influences in their lives, but also in working with communities to use appropriate media technologies to communicate with each other or with others in the country.